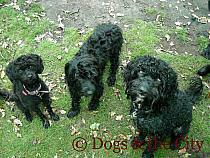 Training your puppy with us is simple and enjoyable both for you and your dog. 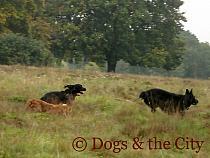 I use reward based methods only, which are kind, effective and supported by animal learning theory and research. My approach can be described as "dog-oriented teaching" as I emphasize the fact that not only dogs need to learn how to live in our society but also we should understand and respect their needs. 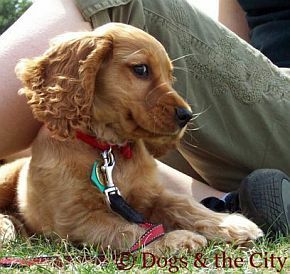 Dogs & the City offers the only puppy classes in the UK where puppies are trained in a large proportion off-lead. The program, inspired by Dr Ian Dunbar’s Sirius school, is designed to teach puppies that control does not come from the physical attachment to the owner but from the bond, communication and mutual respect that builds between human and canine during well-designed training. Classes are fun and held in a relaxed atmosphere to provide a friendly environment both for you and your puppy. There are no more than 7 puppies in a group so you will receive plenty of individual attention. Classes are held indoors in a hall in Learning Lodge at Pimp Hall Nature Reserve Behind Kings Road Recycling Centre, off Kings Road, Chingford E4 7HR (parking available on site / 15 mins walk from Chingford Overground Station) but if weather permits we are using outdoor space adjoining the hall. The course is divided into two parts, each of them lasting 6 weeks (1 hour per week). 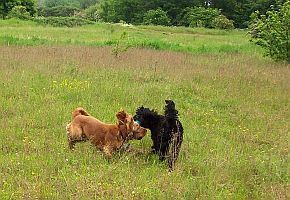 The first part covers plenty of supervised socialisation with other puppies and people and the following skills: name recognition, two types of off the lead recalls – fun, loose (this way, follow me) and more strict one, come (close enough so you can reach and hold your dog’s collar or harness – a very important part of recall, because it is in no use if you can call your dog, but cannot put him on the lead, because he jumps away when he sees a hand reaching towards him), both recalls practiced away from four- and two-legged playmates, walking on a loose lead, two positions: sit and down, staying in both of them positions while the owner walks away or stands next to a puppy, leave (objects like food treats and toys both held by people and left on the floor), drop (letting go of anything that puppy is holding in his mouth), watch (an attention getting and concentration on the handler exercise, an eye contact with the owner on cue), by me (a hang around, do not walk away command, more relaxed than a stay as a puppy is allowed to choose a position and where to be as long as it is close to the owner – this command prevents dogs from wandering, walking or running away from the owners when off the lead), sending to bed, waiting politely by a bowl during meal times and - if the time permits – such tricks like targeting a hand, giving paw and slalom between owner’s legs. Puppy course is designed for puppies up to 20 weeks of age at the start of the course. If your puppy is older but you are looking for classes to attend anyway, please get in touch to discuss your requirements.